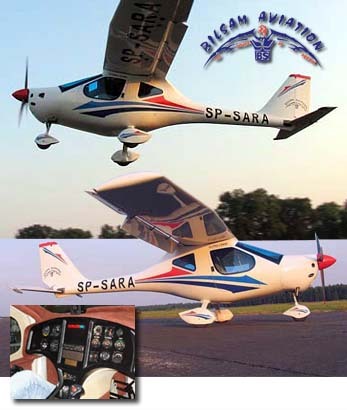 Sky Cruiser from Bilsam Aviation has been created by a company experienced in glider building, common in Eastern European countries. Four years in the making, the Polish design is all carbon fiber with cantilever wings that are said to produce a 15:1 glide ratio. They still sneak by...under the radar. Welcome to Sky Cruiser, which won approval before Oshkosh. As the LSA industry heads toward its #100 SLSA approval -- perhaps by the April 2009 fourth-year anniversary date since the first approval -- welcome to #84 (previously reported #85). *** Built by Bilsam Aviation in Poland, the Sky Cruiser is represented in the U.S. by Joe Carswell's Light Wing Sport Aircraft. His company also sells Allegro and X-Air plus Titan kit-built aircraft, all of which occupy the lower price range of Light-Sport Aircraft. Based in Morganton NC, Light Wing provides flight training at Clyde Valley Airport. *** To top out their line of modestly priced LSA, the Carolina company imports the Sky Cruiser. Plenty of technology details or specs can be found on the Bilsam website but the highlights are: Cruise 108 knots with a 100-hp Rotax 912 swinging a 3-blade carbon prop; stall 40 knots; climb 1,050 fpm; gross weight 1,298 pounds; empty weight 704-770 pounds, depending on equipment selected, which can include an optional factory installed parachute; 26-gallon fuel capacity yielding a 600 mile range; and a broad 48-inch wide cabin. Sky Cruiser wings detach in 30 minutes for storage or trailer transport. They still sneak by…under the radar. Welcome to Sky Cruiser, which won approval before Oshkosh. As the LSA industry heads toward its #100 SLSA approval — perhaps by the April 2009 fourth-year anniversary date since the first approval — welcome to #84 (previously reported #85). *** Built by Bilsam Aviation in Poland, the Sky Cruiser is represented in the U.S. by Joe Carswell’s Light Wing Sport Aircraft. His company also sells Allegro and X-Air plus Titan kit-built aircraft, all of which occupy the lower price range of Light-Sport Aircraft. Based in Morganton NC, Light Wing provides flight training at Clyde Valley Airport. *** To top out their line of modestly priced LSA, the Carolina company imports the Sky Cruiser. Plenty of technology details or specs can be found on the Bilsam website but the highlights are: Cruise 108 knots with a 100-hp Rotax 912 swinging a 3-blade carbon prop; stall 40 knots; climb 1,050 fpm; gross weight 1,298 pounds; empty weight 704-770 pounds, depending on equipment selected, which can include an optional factory installed parachute; 26-gallon fuel capacity yielding a 600 mile range; and a broad 48-inch wide cabin.